I've really been floundering this year about what to do for Lent. Of course the not-to-be-devalued traditional penances of additional prayer, fasting and almsgiving are in the bag. But I really wanted to have a more pointedly personal season of conversion this year. Last night, when I was really beginning to despair of finding a suitable tailor-made penance for Lent, a painful wave of self-revealing inspiration came. 1. Bossing my husband around. Just because I know he'll do almost anything I ask doesn't mean I should ask. Especially if I'm just asking because I'm too lazy to do it myself. 2. Micromanaging. Contrary to every instinct in my being, there is more than one way to do any given task, and it doesn't always have to be done my way. 3. Critiquing food. "This could be better if it had..." "You know what would make this really good?" "If this were just a little riper..." "If this were a little thicker..." "If it had been cooked just a few minutes less..." "I bet a little .... would really help this." Under the guise of being a culinary genius, the quest for foodie perfection is an ugly habit that betrays a hedonistic sensuality and revolting lack of gratitude. 4. Griping rather than serving. "You left the cabinet doors open." "You left the shower door open." "You left the light on." How much effort does it really take for me to close a cabinet door? 5. "I'll do it later." There are no safer words to assure that it will never be done. If the task takes less than 5 or 10 minutes, there's no good reason not to do it now. 6. Sulking. My passive-aggressive self absolutely loves a good sulk. For instant gratification, it's so much more satisfying to wallow in being offended than to articulate the grievance and seek resolution. More than half the time, once I've wasted a gorgeous day cold-shouldering and sulking, I find out that the offense was actually a complete misunderstanding with no real wrong committed... which leads to further sulking. 7. Gossipy prayer intentions. For the sake of getting to talk about other people's problems, I've been known to couch any juicy gossip in a prayer intention. "Yeah, we really need to pray for Betty Lynn. Her marriage is not doing so well." "Georgeanne nearly had a nervous breakdown. We really need to add her to the prayer list." And at least for these... I don't intend to break on Sundays. Hahaha! I love that LOLcat. Yeah, I've always got a few of those, too. Trying too hard to be clever, and taking far too much delight when I succeed. Telling myself "oh, I've got five minutes" to laze around, when really I should have been moving ten minutes earlier (that's how I'm late to everything.) Giving in to nervous habits. I find that it's a lot easier for me to successfully give up something concrete than such personal vices, but it's always worth a try... Best wishes for a holy Lent! Trying too hard to be clever is a Twitter sin :). Yeah, it's harder for me to "do something" than to give up something, 'cause I never know if I've actually done it. "Did I pray more today than yesterday? Well, I guess so." But with personal vices, I can kinda tell when I'm doing 'em. 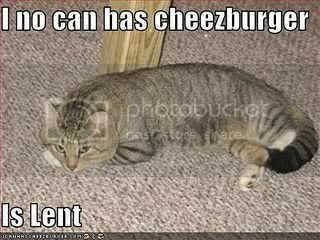 LOLcats make me happy :-D.
Amen :). What is the vocation of marriage for, if not to lead each other to heaven? These are great thoughts. I have been throwing around a lot of ideas in my head as to what to do for Lent. (I better hurry! Counting down the hours!) I love to add a Rosary-A-Day intention to whatever else I plan to offer. It tends to help keep me focused on the reason behind everything I do during Lent. You gave me a couple ideas to seriously ponder, especially "bossing around my husband." I tend to do this a lot on those rough days. Best of luck to you through the Lenten Season! My husband and I made a deal years and years ago that whenever one of us had great gossip, we could share it with each other, but with no one else. It works pretty good. Oh, I almost forgot! A 54 Day Rosary Novena, if begun on Ash Wednesday, will end on Divine Mercy Sunday / Feast of St. Joseph / Beatification of Pope John Paul II. Seems like a pretty awesome day :). Rosary a day is definitely a great one this year! No, I'm BAD! That's the whole point of those post, silly :-p.
Hehehe... that policy would be dangerous for us -- I can never remember which conversations are prayer intentions and which ones are strictly gossip ;). You are a Saint in the making! I love your blog, and I especially love your spiritual insights! Thank you very much, Carrie! :) I appreciate your kind comment. These are all excellent! Griping is something I do far too much, and I am trying to start by 1) doing my griping to God only and 2) countering my whiny thoughts with an act of gratitude. It is almost impossible to whine after telling the Lord that you are thankful for this or that. Excellent food for thought :). Thanks, Nadja! Just discovered this blog while searching for Seder Meal scripts, and I love it. This year I am trying to realize my limitations, one of which is NEVER, EVER making it through Lent without cheating. So, instead of giving something up, I am doing a few extra things - praying the rosary more (a full one for me, and a decade a day with my 7 year old,) spiritual reading (loving Scott Hahn,) using sacrifice beads a few days a week (realizing opportunites for random acts of kindness a lot more!) and remembering to say grace before meals (not so easy with my non-Catholic husband at the table...) I know I will not be perfect at any of this, but if I get in even one or two things a day, I'm still ahead of my pre-Lenten self. Welcome! :) Thank you for your kind comment. I'll pray for you to have a grace-filled Lent! Sacrifice beads and Scott Hahn rock :-D... and one can never go wrong with the Rosary. That reminds me... I was supposed to make that Seder script into a printable size this year.